Last night I attended a party with the spouses club. The spouses club is an unofficial group that formed out of a need to develop friendships with like-minded people and we try to have one outing a month, usually at a restaurant in town. “Why spouses only?” you might ask. The fact of moving overseas for your husband’s or wife’s job is that you will have to give up yours and since you are not a citizen of the new country you call home, you will not get a new job. It can get lonely and so it is good to meet other spouses and get out of the house. I’m considered one of the lucky ones who was able to keep her job since I worked remotely anyway. My company allowed me to continue my work while overseas and has even footed the bill for Price, Waterhouse Coopers to do my taxes for me since they are now much more complex. Of course, I am often jealous of the other wives who do not have to put in a 40 hour work week–grass is always greener right? And it was an impressive spread! 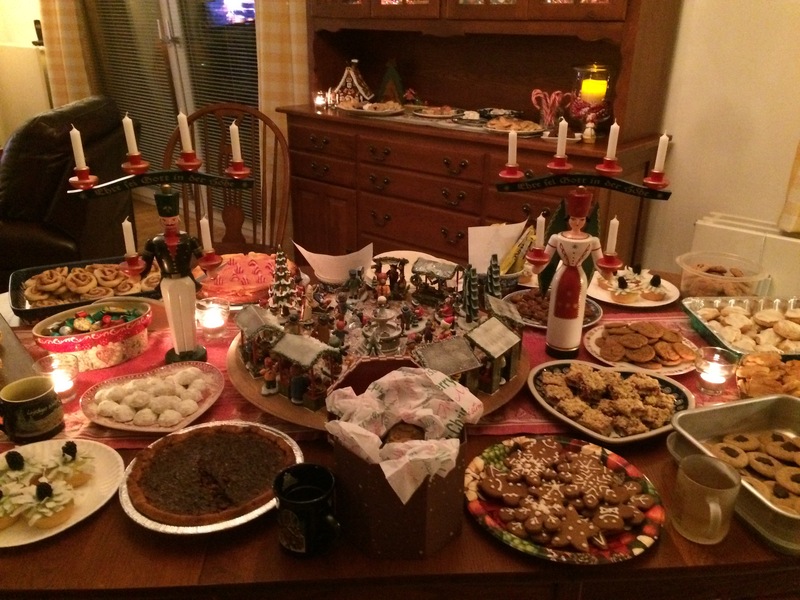 Everyone took home big plates of cookies–there were classics like gingerbread, oatmeal and peanut butter and several unusual options like pineapple cookies and lavender nougat. There was, of course, a big pot of gluhwein as well. 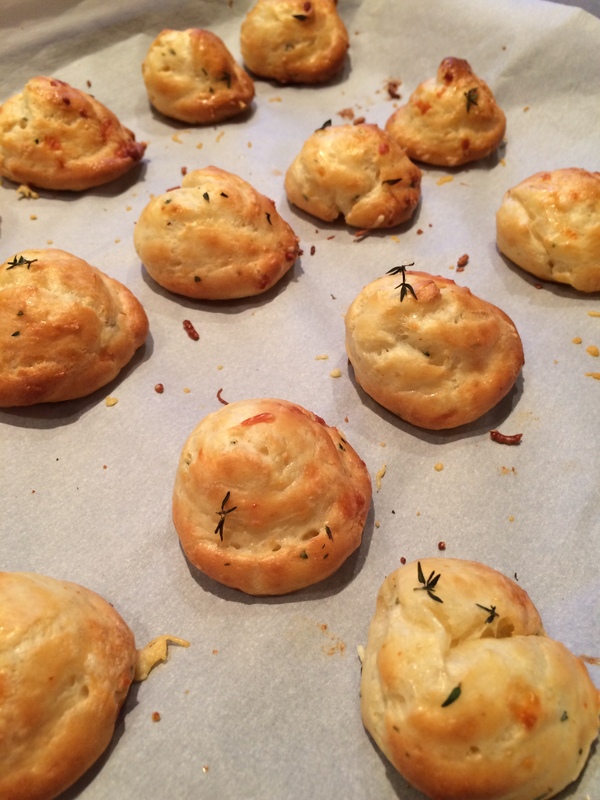 I decided to bring one of my favorite appetizers: Gruyere and thyme gougeres. These light and airy treats, which are essentially a savory cream puff without filling, are a great appetizer because they aren’t too heavy, go excellently with wine, require only a few ingredients and are relatively easy to make. 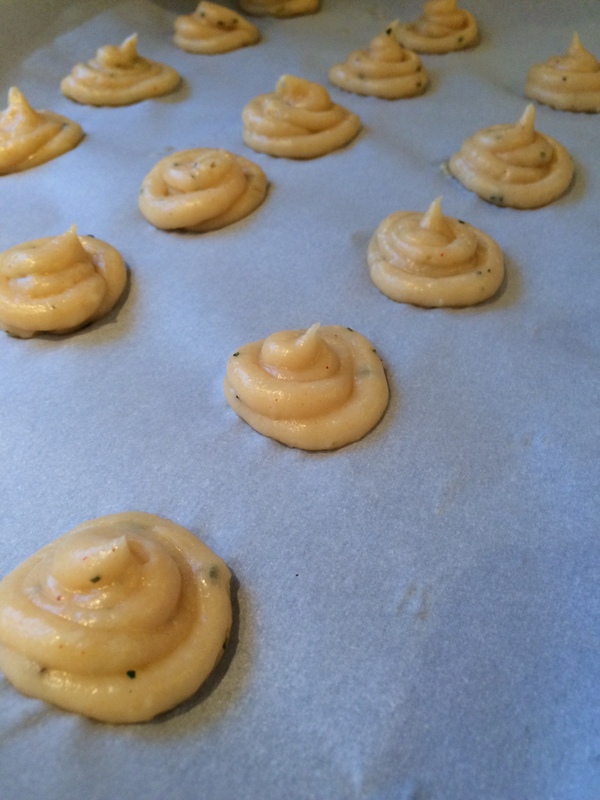 The hardest part about these is piping the dough out, and even that is pretty easy. Also highly recommended is a stand mixer, but this could certainly be done with a hand mixer or even just with a whisk and some determination. A note about the cayenne pepper: you will often see it added into recipes like this (crab cakes is another I can think of) where only a pinch is added. The purpose here is not to provide any heat but to create a mouthfeel– a little cayenne give you just a little tingle in the cheeks and enhances the other flavors. Now put the pot back over the heat and stir until it forms a ball and doesn’t stick to the sides of the pot. 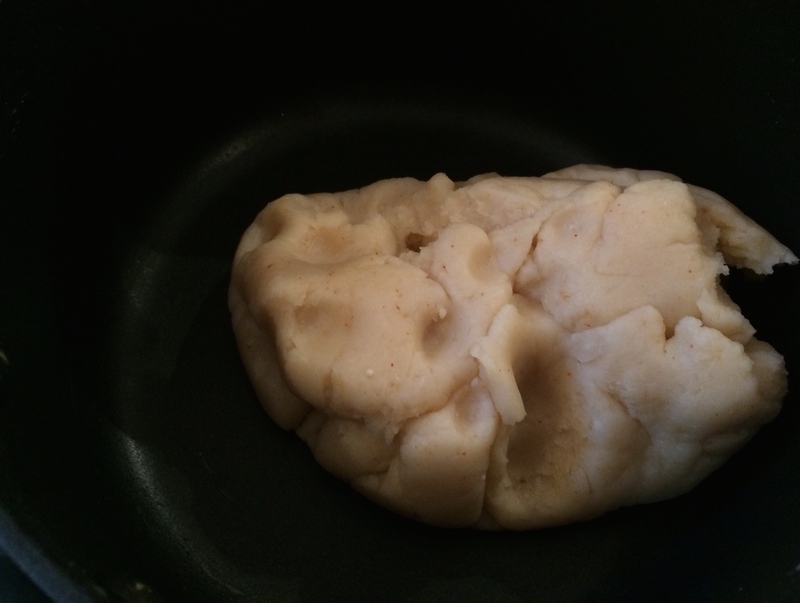 At this point, the dough will look a lot smoother. Now it’s time for the stand mixer. Plop the dough in and add the cheese and thyme, things will be smelling wonderful in your kitchen at this point. If you’re living in a foreign country and are using a transformer to operate the mixer, don’t be scared by the smoke like I was. 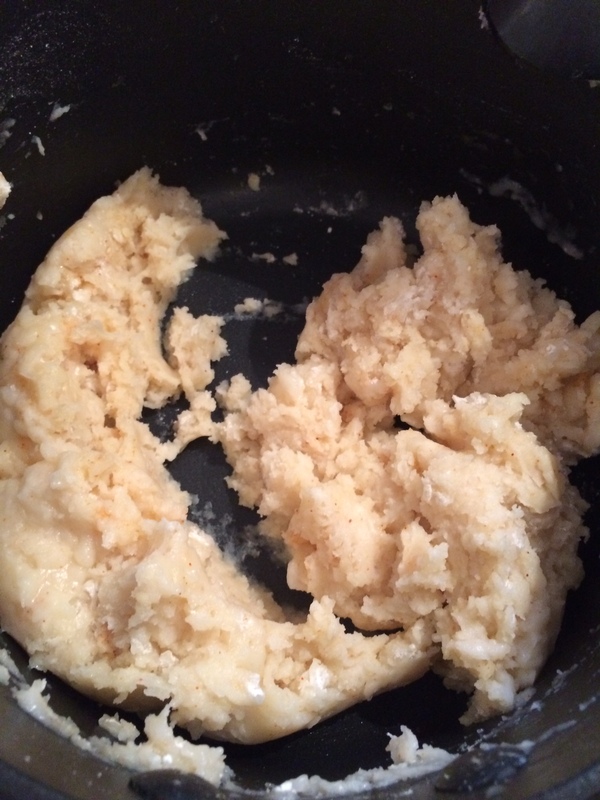 The dough is hot and there will be steam coming from the bowl, the KitchenAid isn’t self-combusting. Now you will add 4 eggs, waiting for each to mix in well before the next. The end result will be a slimy, heavy dough. At this point you will put the mixture into a piping bag and pipe out into 1 inch-ish (I am never precise about it) circles. A word of caution though: I actually bought a pastry bag this time and it was a disaster. In addition to the fact that the bag actually burst down the seam at one point, the sticky nature of this dough is hard to get into the narrow opening of a pastry bag. My favorite method is simply to take a one gallon ziploc bag, fill it with the goopy dough and make a small cut on one corner. Voila: instant pastry bag that is easy to fill and won’t bust. All piped out and almost ready for the oven. 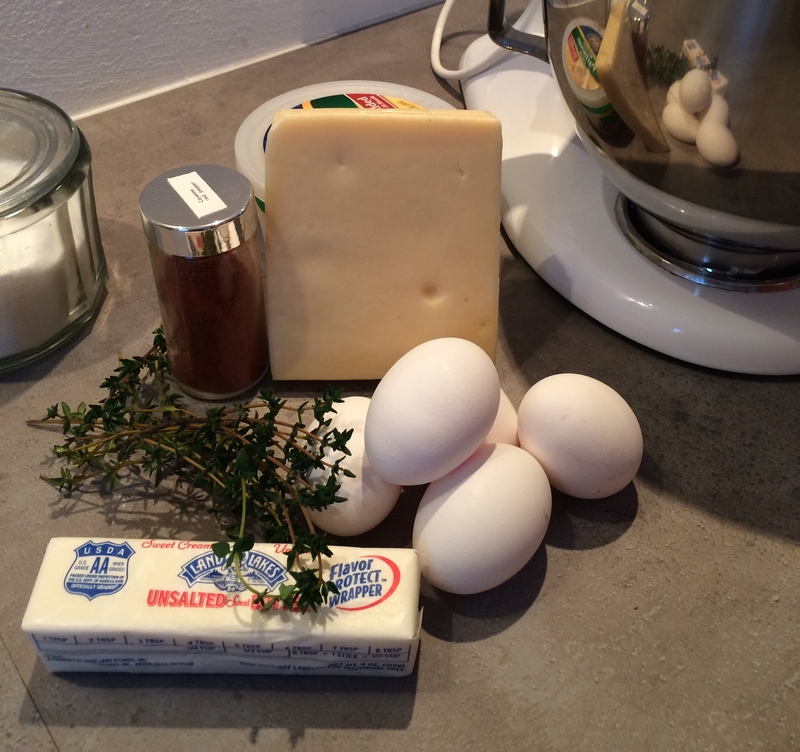 The final step before the oven is to make a little egg wash (beat an egg with a splash of water) to brush over each, patting down the point as you go, and springy them with a little more cheese and thyme. Heat oven to 400 degrees (200 Celsius) and line 2 baking sheets with parchment paper. Chop your thyme and grate the cheese so it is ready for later. 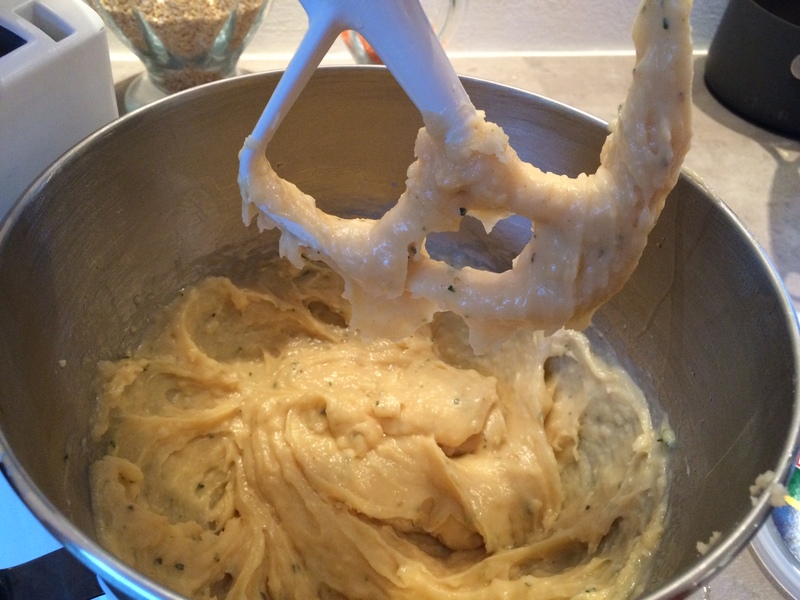 IN a stand mixer fitted with the paddle attachment, add the dough, cheese and thyme and give it a mix to blend. On a low speed add 4 eggs, one at a time. Put dough into pastry bag (or gallon ziploc as I describe above) and pipe into 1 inch rounds, leaving about 1/2 in between each. Place in oven for 20-25 minutes until puffed and golden. These are best eaten while still warm, but are also good at room temperature. They can also be frozen and reheated in a 325 degree oven for about 10 minutes.